Tickets purchased by December 26 will display the two draw dates you are entered to win - a weekly drawing and the Grand Prize drawing. If you are a $50 instant winner, the terminal will play a tune and your ticket will contain a Prize Alert Symbol. A Cash Prize Coupon will print along with your ticket. 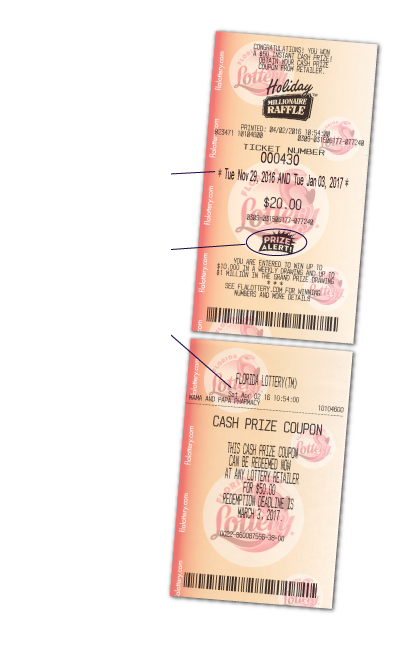 Cash Prize Coupon can be redeemed instantly for $50 at any Lottery Retailer or Lottery office. Issues concerning the transaction or instant prize should be resolved before leaving the store. it to claim your prize. With seven new millionaires and only 750,000 tickets available, your odds to win $1 million have never been better! Buy early to also have the chance to win up to $10,000 in a weekly drawing, plus every 40th Raffle ticket purchased statewide will be a $50 instant winner until the first 100,000 tickets are sold! Holiday MILLIONAIRE RAFFLE™ tickets will be on sale beginning Monday, October 31, 2016, until Monday, January 2, 2017, or until all 750,000 tickets are sold, whichever occurs first. To play, visit any Florida Lottery retailer and ask to purchase a Holiday MILLIONAIRE RAFFLE ticket. Each ticket costs $20 and contains a unique number that will be automatically entered in the Grand Prize drawing on January 3, 2017. You Could Win up to $10,000 in a Weekly Drawing! Purchase your Holiday MILLIONAIRE RAFFLE tickets by December 26, 2016, and in addition to the Grand Prize drawing, you'll also be automatically entered into the next available weekly drawing for a chance to win the $10,000, $1,000, or $500 prize! The five weekly drawings begin on November 29, 2016. Buy Early for a Chance to Win $50 instantly! Every 40th Holiday MILLIONAIRE RAFFLE ticket sold statewide will be an instant winner of $50 until the first 100,000 tickets are sold. *Estimated odds if tickets are sold out and sold proportionally throughout the promotion. The actual odds of winning depend on the number of tickets sold for each weekly drawing. If your Raffle ticket number matches, in exact order, any of the winning numbers in the drawings in which you qualify, you are a winner! Winners of the five weekly drawings will be from Raffle numbers sold during the entry period for that drawing. Winners for the Grand Prize drawing will be drawn from all Raffle numbers sold during the promotional period, including winners from previous weekly drawings and $50 instant winners. Hold onto your Holiday MILLIONAIRE RAFFLE tickets. Winners must have them to claim their prizes.